Given the town’s turbulent history, it is not surprising that no medieval records relating to Berwick-upon-Tweed’s administration have survived locally. However, the town’s series of royal charters do survive (8 in all), the earliest dating from 1415. The town’s records, which date from 1505 to 2009, include minute books, accounts, correspondence and enrolment books. The first enrolment book contains a Survey of the Town taken in 1561/2. The Guild of Freemen administered the town from its James I (James VI of Scotland) charter of 1604 until 1835, and their minute books, and the subsequent admission registers dating from 1835, record the admission of Freemen to the Guild to the present day. Through these books and registers, the descent of Freemen can be traced, back to a family’s original admission. (In 2010 women were admitted to the Guild for the first time.) Berwick being a “County of itself” from 1835 until 1974, the Record Office holds records relating to its County status, including Quarter Session records, which predate 1835, until the Sessions’ demise in 1951. The Record Office also holds a range of privately deposited papers, photographs and tape recordings from the local area. Berwick minute book. This page from October 1609 illustrates a change of Mayor and a list of the documents handed over. Click the image to see a larger version. 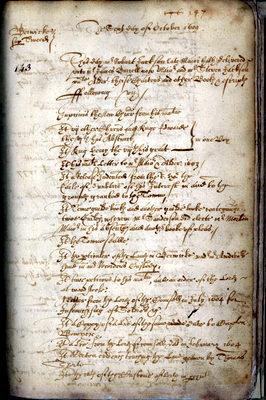 According to entries in the Borough Guild minute books, from 1556, each time a new Mayor was elected, a list of significant Borough documents (along with the Town’s Plate) was made, indicating the perceived importance of the Borough records to the civic authorities. This annual listing continued until the 1630s. George Ridpath, in his 1776 Border History of England and Scotland, makes mention of unsuccessful attempts to consult the Guild Books, in the custody of the town’s Recorder. Later, in the 1820s, there are references to the archives being used in Court cases by the Borough and the Guild minute books being rebound (in 1824). One of the last recorded actions of the Guild in 1835 is its ordering the printing of 600 Guild Rolls to be distributed to each Burgess. The new Town Council, created by the Municipal Corporations Act 1835, continued this interest in its records. In 1836 it set up a Special Committee on the Corporation Papers and appointed Berwick’s first named cataloguer of the Borough’s archives, John Rowland, to draw up a “Systematic Catalogue” of the Borough’s books and papers. The then Town Clerk, Mr Weddell, was a keen historian and had already obtained permission “to peruse and take extracts from the Books and Papers in the Archives of Berwick” for his proposed history of the town (Mr Weddell’s notes survive in the present Borough Archives). The Special Committee was also asked to look out a proper place “for the purpose of keeping the old books and papers”. In 1840 the Corporation’s papers (amounting to several thousands in number) were used by the Corporation in a major lawsuit with the Freemen. In that year many of the records were sent “to a London workman for repair and preservation”. There is reference in the Borough minutes to a Documents Committee reporting to the Town Council in 1898. Although its work is not recorded, yet there is a record of it acquiring a copy of a Report on the records produced on behalf of the Royal Commission on Historical Manuscripts in 1872 by a Reverend Joseph Stevenson (a copy of this very brief Report exists in the current Borough Archives). A more substantial Report was commissioned by the Royal Commissioners in 1901 and produced by their regular cataloguer, W.D. Macray. The biggest crisis potentially to threaten the Borough records in modern times was the Government’s waste paper drive during World War II. Nevertheless, the Town Clerk asked advice from the Town Council on the removal of records to a place of safety during the War. It was resolved that a suitable place for the storage of the records be found, although no details are given in the minutes. 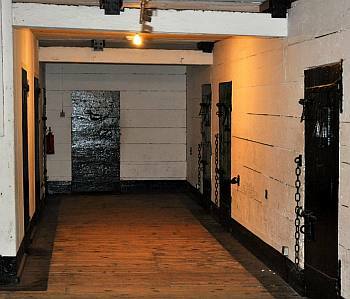 The prison cells in Berwick Town Hall, sometimes home to the archives and the staff. Photograph: Richard Ormston. In July 1956, a chance inspection of the Borough’s charters by a member of the Sussex Archaeological Society led to the Town Clerk visiting the Public Record Office in London and subsequently being authorised by the Town Council to arrange for “the preservation of the charters”. 1958 was the year of The Public Records Act and also the establishment of the first Northumberland Record Office, based in the Moothall, in Newcastle upon Tyne, under County Archivist Hugh Taylor. In 1960 it was approved by the Lord Chancellor as a place of deposit under the Act. Berwick soon asked Mr Taylor to assist them in sorting and listing their records, but instead Mr Taylor suggested a Cambridge graduate, P. Rutledge, to undertake this work, whose costs were met in part by the Historic Manuscripts Commission. In 1960, Mr Rutledge’s list was produced and Mr Taylor suggested that Berwick’s records be transferred to the new County Record Office in North Gosforth, just outside Newcastle, but Berwick’s only response was to instruct its Town Clerk to obtain the advice of the British Records Association on the heating of the cells in Berwick’s Town Hall, where some of the archives were kept, “in an endeavour to preserve the records from further deterioration”. However, a microfilm copy of the early records was lodged at the County Record Office. At the end of 1970, there was correspondence with the new County Archivist, Robin Gard, on the possible establishment of a Berwick Record Office. On 1st April 1974, the Local Government Act 1972 came into force, which established District and County Councils with separately defined responsibilities, and so ended the rights of historic Boroughs such as Berwick to manage their own records as they saw fit. The Act required Local Authorities to make “proper arrangements” for any documents that belonged to them or were in their care. For the purpose of the Act, Northumberland County Council was deemed the sole archive authority. The Clock Block of Berwick Barracks, proposed home for the archives on several occasions. It now houses Berwick Museum. Photograph: James Allan/Geograph, licensed by Creative Commons, CC BY-SA 2.0. As a show of independence by the new Council, now known as ”Berwick-upon-Tweed Borough Council” (and now including the former Rural Districts of Belford, Glendale and Norham and Islandshire), one of its first acts was to confirm the loan of certain of its records to a translator “for incorporation in the eventual publication of the Charters” (as previously arranged by the old Borough Council in November 1972). From 1972, the County Archivist, Robin Gard, had tried to encourage the Borough Council to reconsider the idea of a Berwick Record Office, but the old Council in May 1973 had started negotiations with the Department of the Environment (DoE) regarding the formation of a History Centre at the 18th century Barracks. This proposal, comprising museum, specialist library and a record office, was supported by Berwick-upon-Tweed Civic Society and the Chairman of the County Council. In 1977, Berwick Council sought advice from the County Council in a project under the Government’s Job Creation scheme to sort and catalogue the council’s old files and books, which were scattered around the Borough, partly in the old Butter Market under the Town Hall and in the cells. Although Mr Gard had expressed a willingness to undertake this task himself, he recommended a recent Edinburgh University history graduate and local woman, Margaret Rennison, initially to undertake the task. The Job Creation programme, which ran from 1977 to 1978, under the title of Cataloguing and Filing of Records of Historical Interest, sorted out the records and produced a more detailed catalogue of its findings. In 1978, the records were moved from the cells in the 18th century Town Hall to the 19th century prison cells in the Council Offices at Wallace Green. Later in that year, Robin Gard again argued for “appropriate record storage accommodation” with a qualified archivist providing supervised access to the records and reported that the County Amenities Committee had agreed to the appointment of an assistant archivist on the County Record Office’s staff with special responsibility for the records of Berwick and north Northumberland, to take effect from 1st January 1979. This was to be Margaret Fox (née Rennison). Progress now began on providing facilities for the accommodation of, and public access to, the records. After a period of protracted discussion, including another feasibility study to make use of the Barracks, the Borough Secretary confirmed arrangements for the County Council’s occupation of the cells and surrounding area in the Borough Council’s offices in Wallace Green. This was to formally commence from 1st July 1980. In addition to Berwick’s own archives, microfilm copies of records relating to the Berwick area, e.g. the census and parish registers, and the records of the former northern Rural Districts (see above), were transferred to the new Berwick Office, along with a microfilm reader supplied by the County. It was agreed that the new Office would open to the public one day a week and that Margaret Fox, assisted by other members of staff, would travel up from the County Record Office in North Gosforth to provide the service. 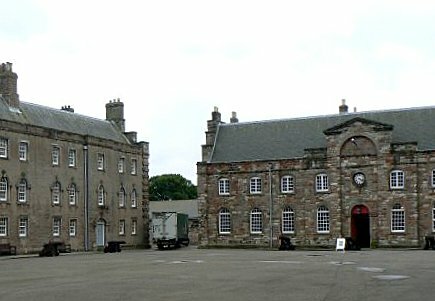 For the next six years from 1980, correspondence and meetings continued about proposals to use the Clock Block in the Barracks as a Berwick Heritage and Interpretation Centre, which would include Berwick’s Record Office. This proposal was supported by Robin Gard who had always regarded the use of the cells in the Council Offices in Wallace Green as an interim measure. In October 1983, following a negotiated lease with the DoE, it was reported that it was Berwick Borough Council’s intention to re-locate the archives from the cells to the Clock Block in the Barracks, along with the Borough’s museum and art gallery. Following an inspection of the area proposed for archive accommodation Robin Gard deemed it as unsuitable, and despite pressure from Berwick Borough Council, the County Amenities Committee backed Mr Gard in his decision. This was probably the only issue regarding their archives which the Berwick local authority had lost over the centuries, although on the vital matter of retaining local control over their records, they had succeeded. 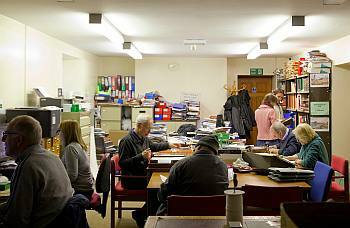 Berwick Record Office’s workroom in Wallace Green, 2015. Photograph: Piotr Piasta. In 1987 Robin Gard retired and was succeeded as County Archivist by Annette Burton, who took up the matter of improved accommodation and by September of that year was in detailed discussion with the Berwick authorities on converting two cottages adjoining the Planning Office for a new Berwick Record Office. At the end of January 1990 the new purpose-built Berwick Record Office was operational, the records having been moved from the cells over that month. Annette Burton also proposed establishing a post of Archivist-in-charge at Berwick jointly funded by the County and Berwick Borough Council and Linda Bankier, a professionally trained archivist on the County Record Office staff, was appointed to this full time post. So Berwick now had its own dedicated archivist, based in Berwick, rather than a member of the County Archives staff based in the County Record Office in North Gosforth with responsibility for Berwick, as had been the situation hitherto. There is much still to be written about the progress which the Record Office has seen since 1990 under the guidance of the archivist Linda Bankier. This history, however, will conclude with the briefest recognition of its ever growing number of users and archival records (including major photographic collections), the range of special projects in which it has participated, the encouragement and training of volunteers which it has provided, and the widely appreciated contribution that it makes to local schools, exhibitions, and the cultural life of Berwick and the surrounding area. That story will be told on another occasion.